Since our last visit to Walt Disney World in 2013, Disney have introduced a new FastPass+ system, replacing the old system, which is now called legacy FastPass. Back then, there were machines outside [some of] the rides, where you would insert your park ticket and then a FastPass(FP) ticket would pop out, which you could use at a later time to head to the front of the line. Depending on the popularity of the ride, you could get one for the next hour or so, several hours later – like we did for Toy Story Midway Mania at Disney Hollywood Studios! We got these FastPasses at just after 9am to return in the early evening! 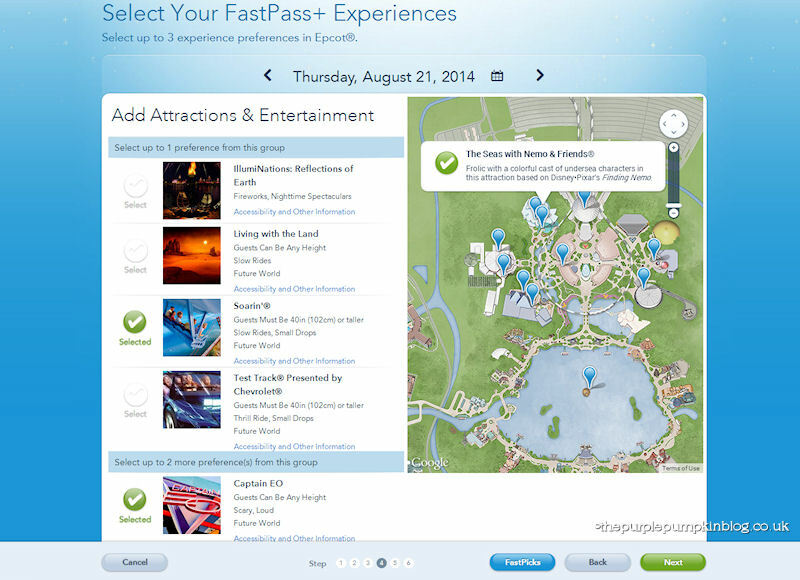 I won’t go into detail about the Legacy FastPass system as it’s moot now, but I am going to tell you all about the new FastPass+ (FP+) system, because we’ve just made our FP+ selections for our upcoming holiday to Walt Disney World (WDW) this August. Now, I’m sure you’re scratching your head and thinking, wait, you’re not at WDW yet – how can you do that? 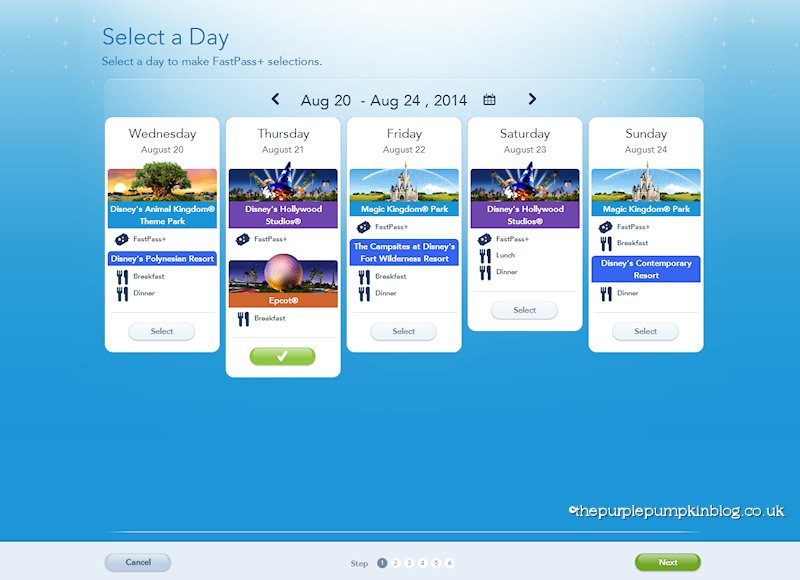 Well, with the new FP+, you can make your selections 60 days in advance (if you’re staying onsite at a Disney Resort, which we are on this trip) or 30 days in advance if you’re staying offsite. You can still get a FastPass+ on the day – either at machines located around the parks (but you don’t have to go all the way to a ride any more), or using the My Disney Experience App. 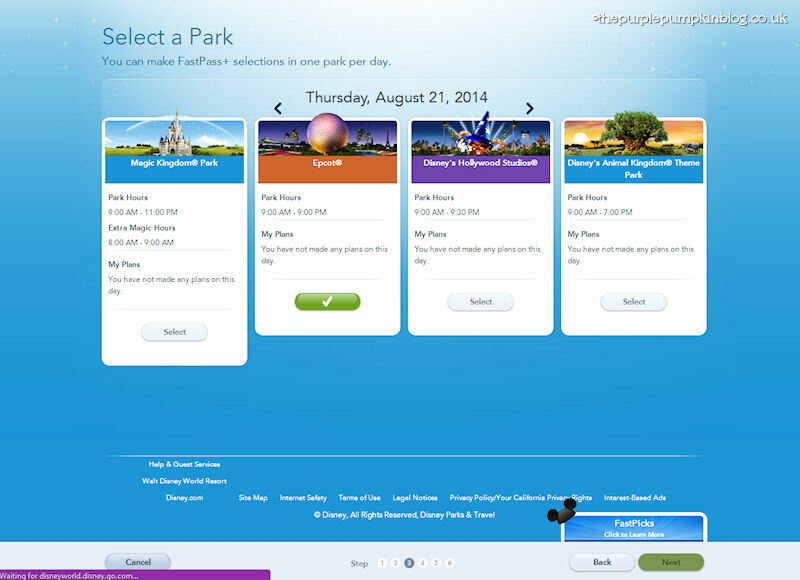 You can make 3 FP+ selections per park. When they are used, I believe you can make more. All Walt Disney World parks have free Wi-Fi, so remember your smartphone so that you can use the app to make changes through the day! I belong to a couple of Disney forums and several Facebook groups, and there has been plenty of discussion (and arguing!) about this new system; me, I prefer to try something out first before passing judgement. If you are not a planner, then I do think that this new system may be a bit much, when you think to yourself, “I don’t know what rides I want to ride in 1 or 2 months time, I don’t even know what park I’ll be in!” and so, booking them on the day would be fine for you – however, the more popular attractions may well run out of FastPass+ so my advice? 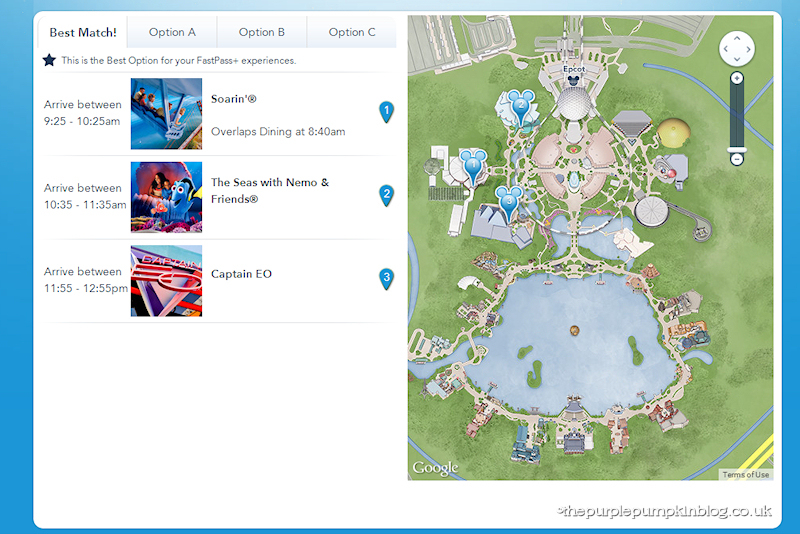 Have a rough plan of parks in mind, and pick a favourite ride/attraction and get that one FP+ for it, you can always change times and rides whilst you are at the park using the app. I also think, that if you’re a first time visitor, it might be overwhelming – you have no clue which rides are good, which are popular, which you want to do…I suggest to all first timers to Walt Disney World to pick up one of the planning books available, check out Disney forums too (and my blog, hey, I like to think I know what I’m talking about when it comes to planning a WDW holiday!) and educate yourself!! Which I know sounds a bit much, but seriously, a WDW holiday is not cheap, and you want to make the most of the time that you are there! On our very first visit to Orlando, we looked at all the rides and attractions in each park, and each decided one that we REALLY want to do/see, and made a beeline for those first – that way, even if we didn’t do a single other thing, we would all have done something we wanted to do. 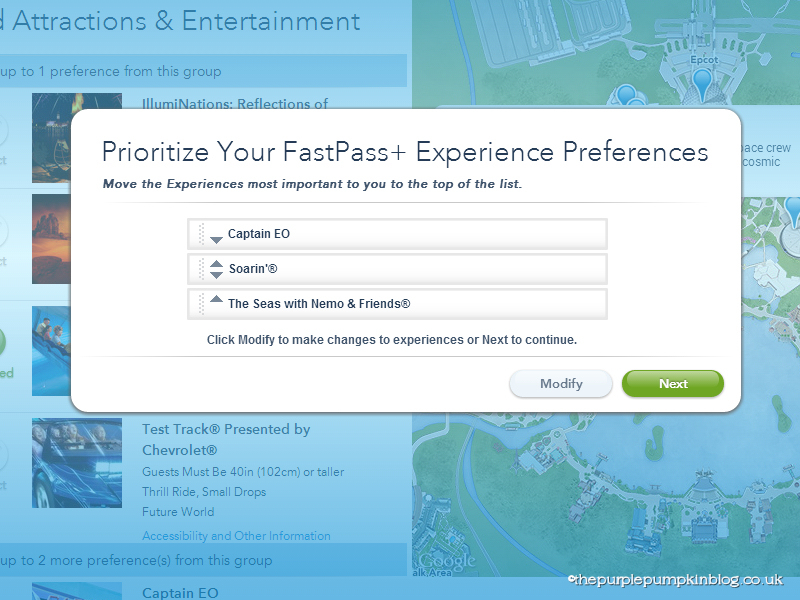 We took a similar stance when it has come to making FastPass+ selections, as third timers, we know what we like, and what we don’t, we know what is super popular with long lines, and have made our plans accordingly. Because we are on the Deluxe Disney Dining Plan, we have two Advance Dining Reservations each day, one for breakfast and one for dinner, it also means that I had to roughly plan our parks for each day of the holiday, this has certainly helped making FP+ selections easier. That said, even if we were not onsite, I would still roughly plan our days, and I do have my handy planner that I shared last year that you can use too. 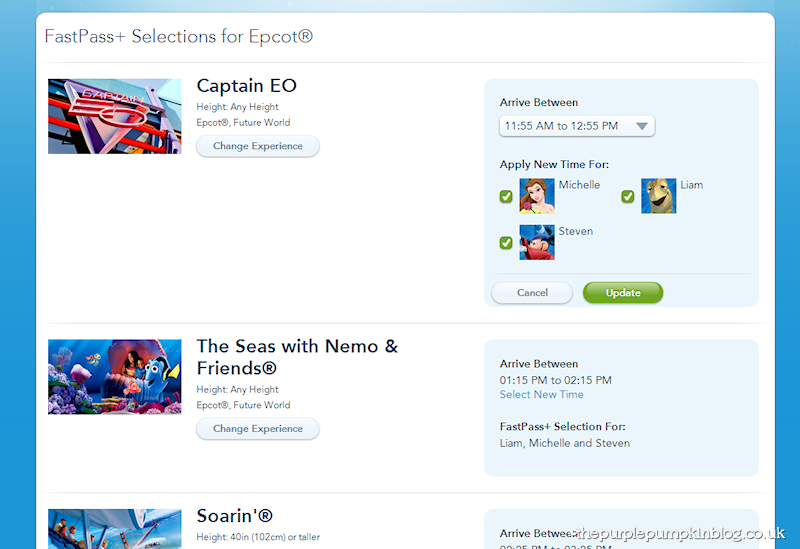 Right, on with how to book FastPass+ online…you need to head to the Walt Disney World website and create an account so that you can use My Disney Experience, which by this point in your planning, you have more than likely already done! When your window for making FP+ selections is available, this screen shot is actually after we did all of ours, but I wanted to show you what it looks like. Select the day you want to book for and click next. 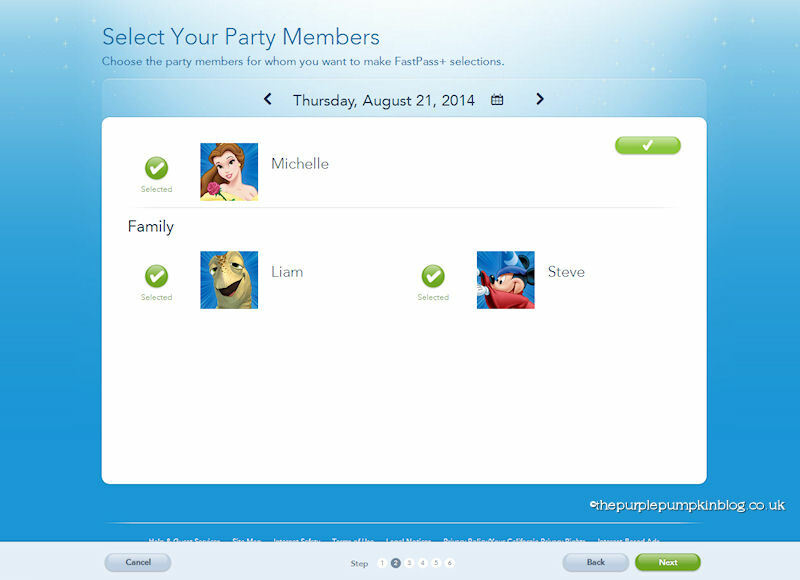 You’ll then need to select your party members – since we all do the same rides, I selected all of us and clicked next. I don’t know what happens if you just pick one person…try it and see!! You then pick the park you want to make your selection at, sadly, you can’t pick multiple parks [at the moment], so all three of your allocations will be in the one park. When it comes to the working of FP+ and the new system, I will report back once we’ve been to WDW! With the park picked, you are then presented with the attractions and entertainment. Some parks have a tiered system (I think Magic Kingdom is the only one that doesn’t) and you will be told how many you can make from each tier. This, I have to say, is one of the annoying things about the new system. And I know a lot of people have complained about this. You then get a pop up asking which priority you want to do the rides in – the one at the top should, in theory be the first one you do that day. You are then presented with the best match, along with three other time options. I like that it pinpoints the rides/attractions on the park map so you can see where they are in relation to each other, I also like that, if I have an ADR booked, it tells me that there is a clash. Take a look at the options and pick the one best for you – you can, however, alter these times manually later. Once you’re happy with everything, you move to the next screen, where you can make changes, so select which you want to change and do what you need to do! You can change the arrival time and the party member, and of course, you can change the experience too. I found the process to be easy and painless, and know that we have got FastPass+ tickets for the rides that we want to do. How the length of lines will be affected by this new system, remains to be seen (by us at least), but I can now sit back knowing that the bulk of our planning for our 2014 trip is done! 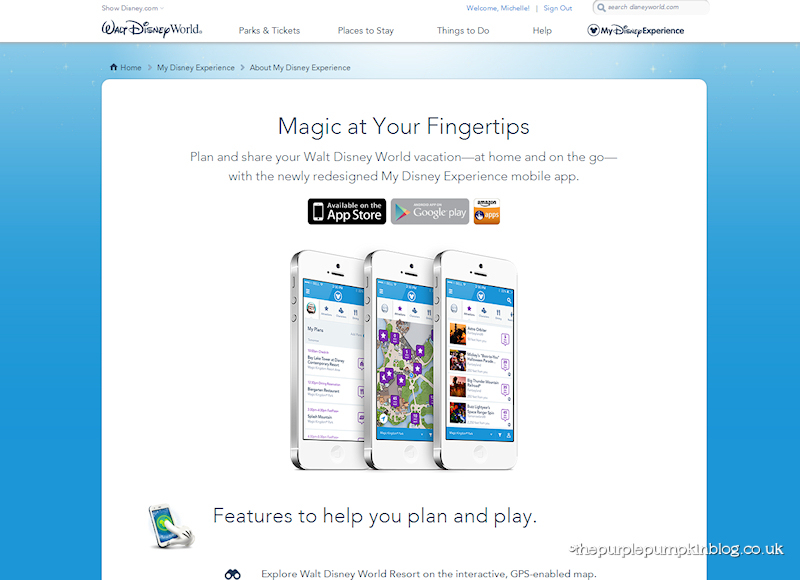 I hope that you found this helpful if you too are planning a visit to Walt Disney World! What a great post. I so hope to take my girls to WDW one day, and this all looks like a planner’s dream. Great tutorial, will be looking through the rest of your tips!